Samantha and Matthew's elopement at TreeHouse Point last fall brought out the B&B's moody and atmospheric qualities. Their intimate ceremony was draped in sultry autumnal colors that contrasted beautifully with the blue family tartan on Matthew's kilt. 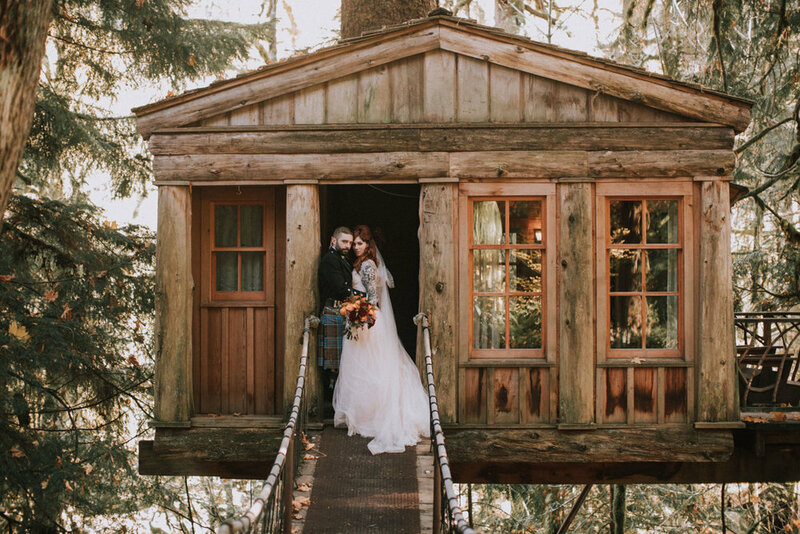 As a teen, Matthew moved from Scotland to Washington State with his family—it was important to him to integrate his Scottish roots into his wedding ceremony. 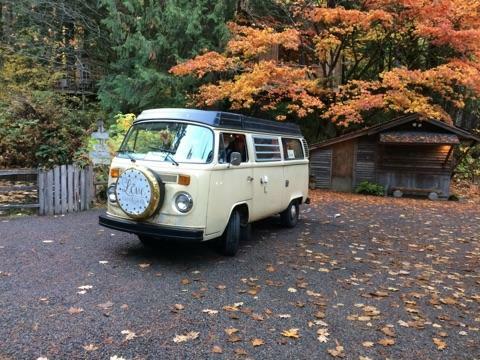 The couple's inclusion of an array of special, sentimental details (from Matthew's grandfather's belt buckle to a Twin Peaks-themed van) made their elopement a distinctive expression of their individual and shared interests. All Photos by Luma Weddings Photography. Samantha and Matthew met online - it only took one date to convince Samantha that Matthew was something special. Samantha proposed to Matthew - the story is incredible! Samantha works as a hair stylist and was speaking with a client one day who explained that she had proposed marriage to her husband. This client's story hooked Samantha, giving her the inspiration to propose to Matthew. In Samantha's words, "I'm pretty shy and don't tend to do that kind of thing - but it was just this flash of inspiration. I knew I could do it, but only if I did so within the next two hours or so, while I still had the confidence." Samantha left work, stopped to purchase a chef's knife as a proposal gift for Matthew (who had worked as a chef), swung by a craft store to get wrapping materials, and headed home. She wrapped the gift and realized she needed to write down her proposal, as she was concerned she would be unable to verbally articulate all her feelings. When Matthew came home, Samantha handed him the box - to which he responded, "But it's not my birthday!" Upon opening the gift and reading the note, Matthew immediately said "yes." The couple still has Samantha's proposal note to this day! Matthew dressed in full Scottish regalia for the ceremony. He ordered his custom-made kilt (with his family's tartan) through Claymore Imports. Matthew also incorporated some of his grandfather's items into his outfit, including his belt buckle and knife. Samantha and Matthew knew they wanted an elopement to streamline the planning process and keep their special day as stress-free as possible. In all, their elopement included eleven guests (and their dog, Furnace, who played the role of ring bearer). Here, Samantha gets ready in the Cedar room of the main Lodge. The couple stayed two nights in The Burl treehouse (pictured here). One of the nights was Halloween - they spent it hunkered down in The Burl, binge-watching Stranger Things. Matthew and Samantha love the spooky, playful vibe of Halloween season and were thrilled to get married at that time of year. The couple hosted their ceremony in the Pond Room. The cedar-lined space opens beautifully to the forest. Matthew's cousin is a professional trombonist and performed a song from Twin Peaks as the opening to the ceremony (Matthew and Samantha are avid fans of the surrealist, '90's TV series). Samantha made the four-foot-long, braided ribbon for the ceremony - connecting a couple's hands with a braided ribbon is an ancient Celtic wedding tradition. The couple also made their own wedding rings by hand at With These Rings studio in Port Townsend, Washington. This unique jewelry studio lets couples customize their rings with 100% recycled metals sourced from a US-based refinery. Down to Earth created the luscious floral arrangements on the arbor. 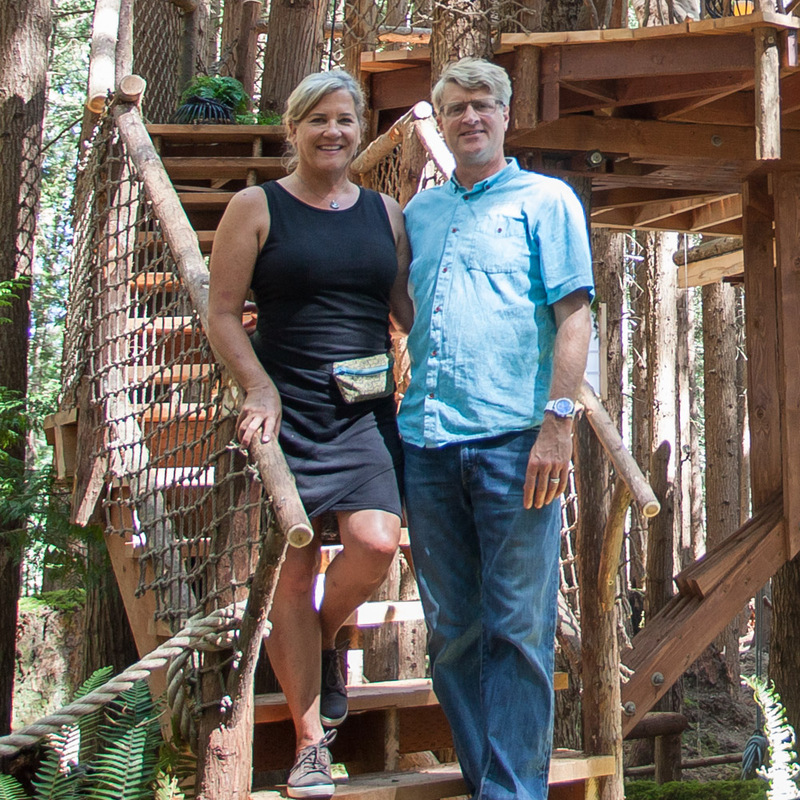 Matthew's parents, Donald and Alison (pictured on left, above), are the owners of the Beehive Treehouse, built by Pete and the crew in 2014. The Beehive inspired Matthew to look into TreeHouse Point as a venue; in his words, "Samantha and I always loved my parents' treehouse - the hammocks inside [the Beehive] are amazing. Just knowing that there were treehouses at TreeHouse Point was enough to convince us that it would be a fantastic place to get married. It's also a really great environment - everyone there was so friendly." A week before the elopement, Matthew decided he wanted to give his own vows to Samantha - the couple had originally decided against penning their own statements. Matthew's words at the ceremony blew Samantha away: "It was definitely one of the most amazing things anyone has ever said to me. I will never forget that moment." At the end of their ceremony, Samantha and Matthew were given a big surprise in the form of transportation to dinner: Matthew's mother had spent days tricking out a family friend's van in Twin Peaks-inspired glamor, complete with a cooler full of cherry pie and damn fine coffee. Their family friend even chauffeured them dressed as Dr. Jacoby from the show. Samantha and Matthew were over-the-moon about the van! Thank you for hosting your thoughtful elopement at TreeHouse Point, Samantha and Matthew! We wish you a lifetime of happiness! WEDDING CREDITS: Venue: TreeHouse Point | Photography: Luma Weddings Photography | Officiant: Janet McIntosh | Florals: Down to Earth | Bride's Hair: Seattle Bridal Hair | Bride's Dress: Monique Lhuillier Bridal Boutique | Groom's Suit and Kilt: Claymore Imports | Rings: The couple made their rings themselves at With These Rings studio in Port Townsend, Washington.